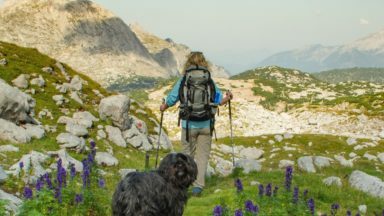 Grant Bourne, the co-author, along with wife Sabine, of Walking in the Bavarian Alps, gives a brief insight into the advantages and disadvantages of walking with a dog. Apart from learning (indirectly) that Khampa is the real boss of this team, Grant has discovered that Khampa loves beer gardens, is easily provoked by marmots and that rolling on the grass can be unpleasant – for some. He also forced his 'masters' to live it up on the E5. Let me explain: Khampa is a Tibetan Terrier, although he is not a terrier (they are hunting dogs) but belongs rather to the shepherding breeds. In far off Tibet these small dogs were used to keep watch over herds of goats or yaks. They were also kept as pets by Tibetan monks, who regarded them as bringers of good luck. These monks took good care of the dogs, as there was always a chance that they might be reborn as one! I am fairly sure that neither I nor Sabine will be reborn as Tibetan Terriers, but I can assure readers that we take good care of Khampa anyway. 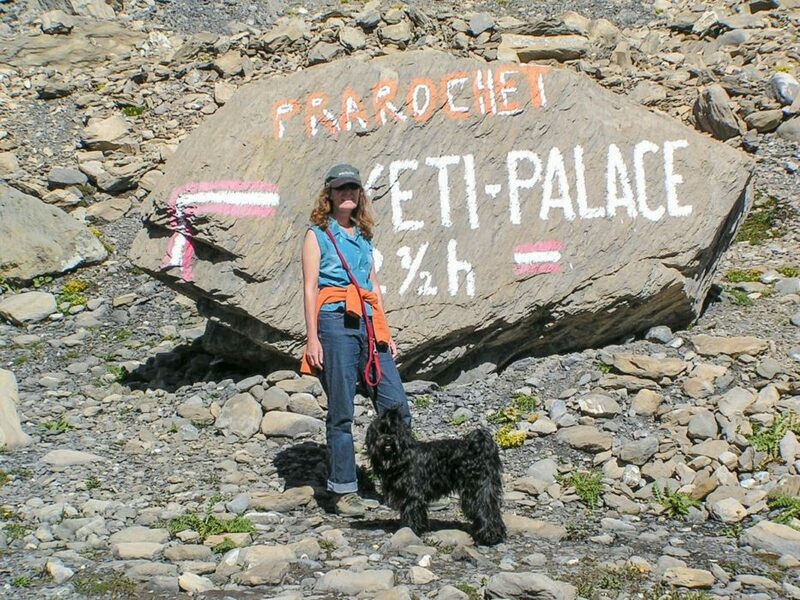 Khampa is, for us, the ideal dog for our walking excursions into the Alps. Because he is of medium size, it is no problem to seat him next to me on a chairlift – a mode of transport he quite enjoys. As he weighs only 10 kilos, I can carry him for short distances under my arm if the terrain is very difficult. Although small he is very robust; his long, thick coat protects him from wind or icy temperatures and he has proved himself capable of walking for hours over even the most rugged of landscapes. All in all, it is what you might expect of a dog from the Himalayas. As a very small puppy Khampa was not all that fond of walking; he seemed to prefer the view from my arms. Fortunately, this changed quite quickly when he discovered walking with us could be fun. Already our short strolls through the local woods were a lot more interesting than a boring walk through town on a leash. 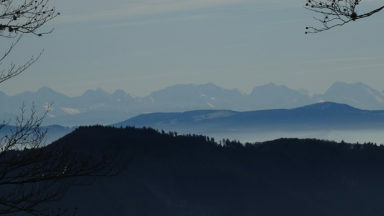 But the big revelation came, once he was a little older, on his first experience of the mountains: the Swiss Alps. 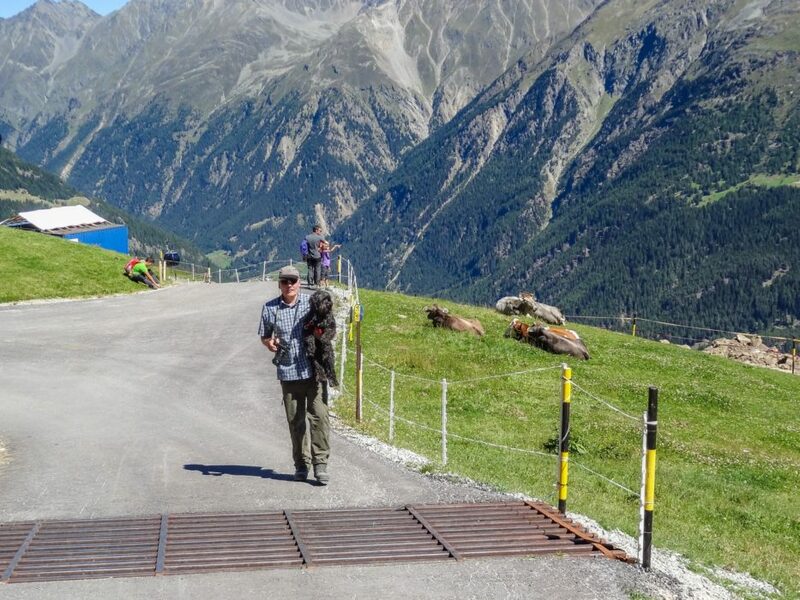 We were descending from Cabane Rambert, in the Valais, when it happened. A loud shriek pierced the air. Then another and another. Marmots! At first Khampa was nonplussed, but then he sniffed the air excitedly and was off. Within minutes he was only a tiny black speck far down the slope, dodging rocks and boulders at breakneck speed. Of course, the marmots had long since disappeared into their holes – Khampa's loud barking provided plenty of warning. It was only after repeatedly calling his name that he returned to us, panting, but very pleased by all the fun he had just had. With him on the leash now, as we knew there was the possibility of encountering marmots again, we continued downhill. Then, on rounding a bend, we came upon a patch of snow; something Khampa had never experienced before. He walked onto it. He scratched its surface. It was cool! Then he started digging more excitedly until, finally, he threw his whole body into the small depression he had created. In an instant he became a barely recognisable mass of hair and waving paws, wriggling in a frenzy of pure joy. It took at least five minutes before we could finally continue along the trail. After two such mind-blowing incidents in a short space of time, Khampa needed no more convincing. From that day on all we had to do was pull on our walking boots and he would come running, tail wagging enthusiastically. 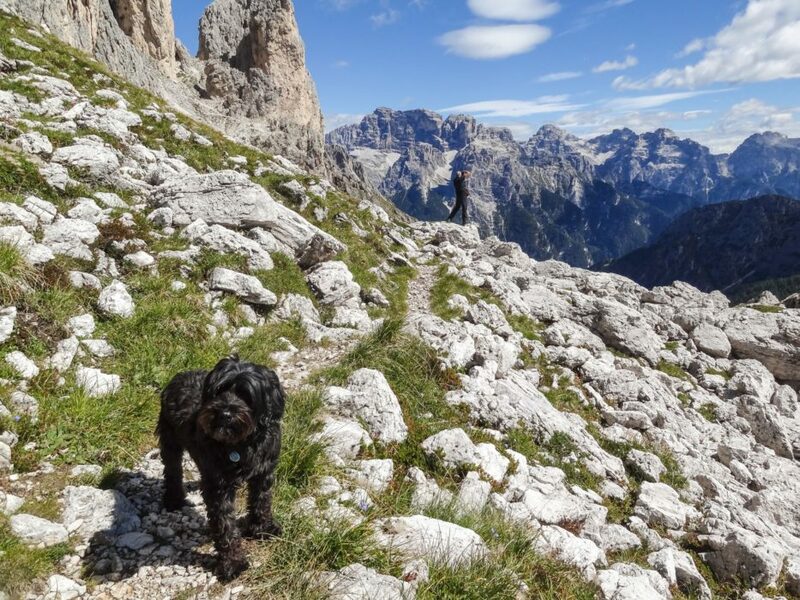 Walking with us could be a real adventure, above all in the mountains, and they have been his favourite playground ever since. Over the years we have continued to share many walking adventures with our dog. 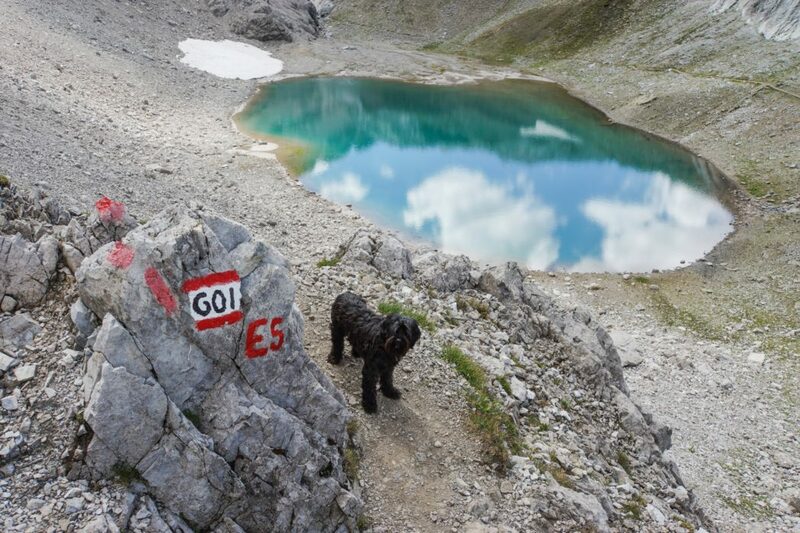 Long distance walks we have enjoyed together include the E5, part of the Via Alpina and the Merano Mountain Trail. 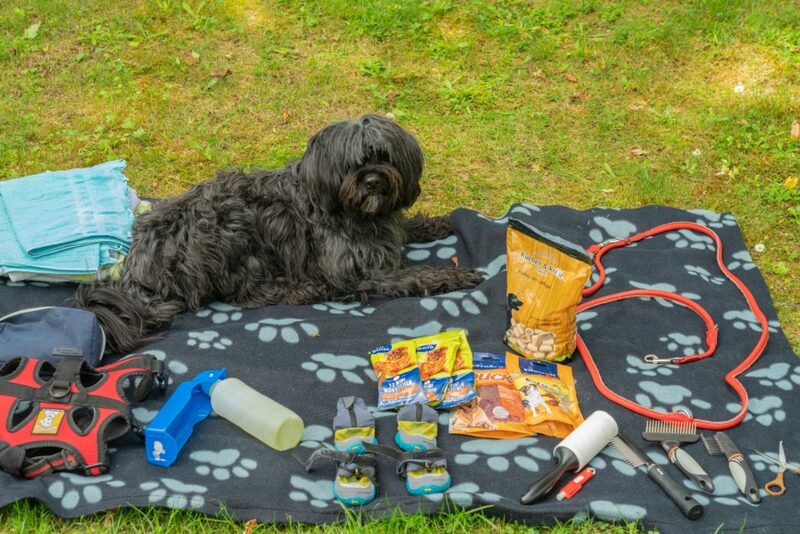 Organising these multi-day treks is a bit more complicated if you take a dog along. 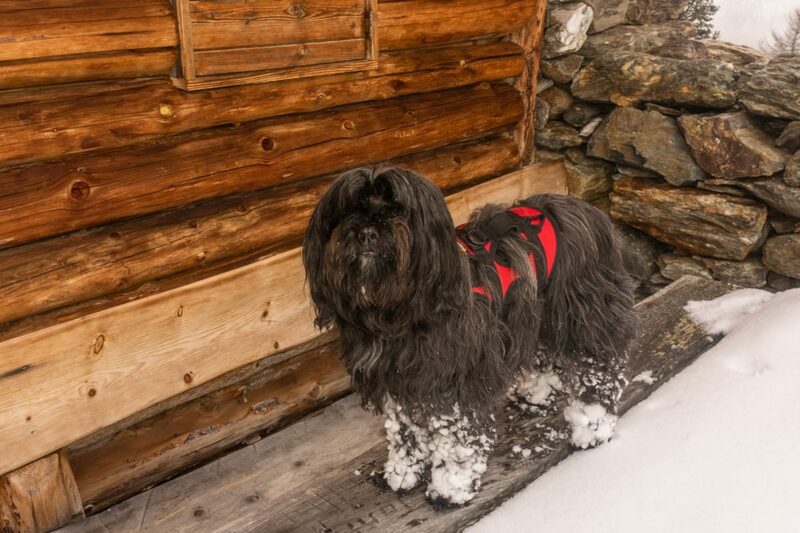 Not all mountain huts accept dogs and if they do they might require that you sleep in the so-called 'winter room'. This is a room or building separate from the main hut that is normally used by alpinists when the main hut is closed in winter. 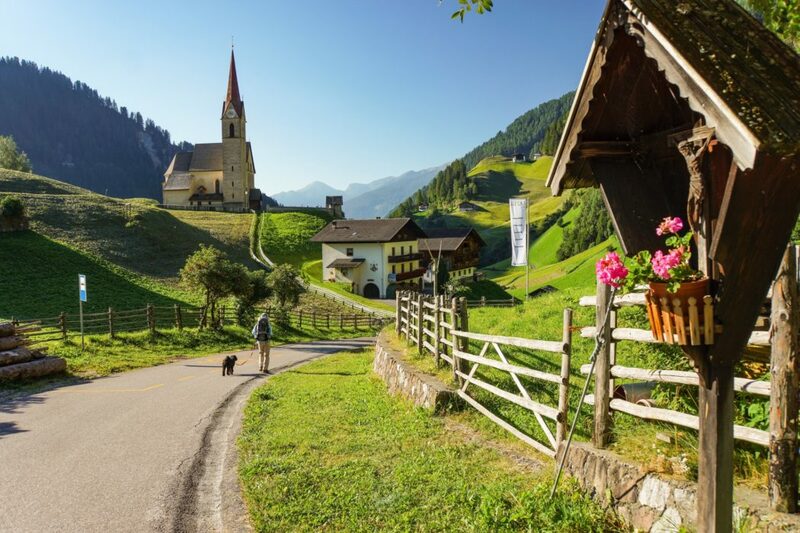 Some huts with double rooms might allow dogs, but that always depends on the Alpine Club section to which the hut belongs. 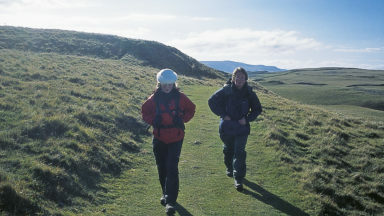 Otherwise, the alternative is a hotel that is close to the trail. 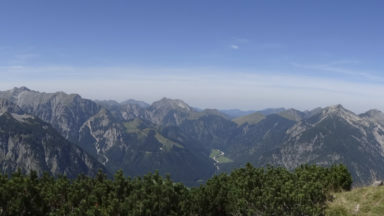 That is how we managed to walk the E5 trail between Oberstdorf in Germany and Bozen/Bolzano in South Tyrol. 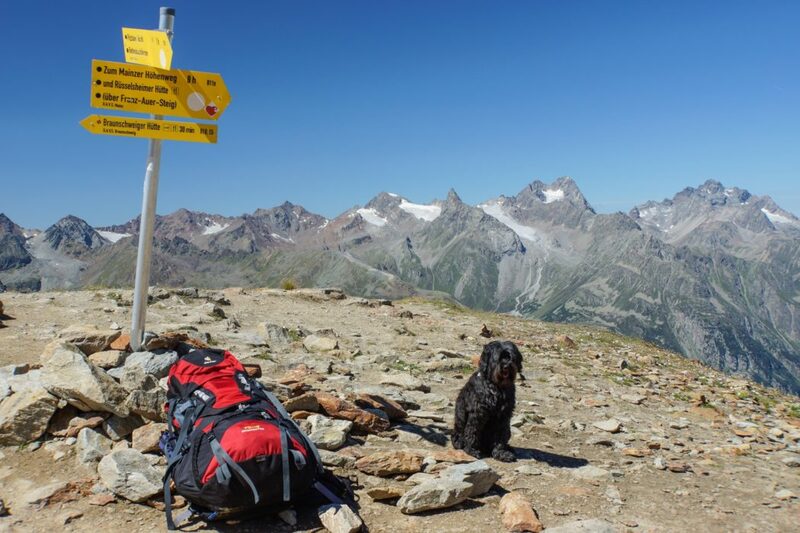 While planning the E5 we were unable to find any mountain huts that were prepared to accept our dog. It certainly did not help that we wanted to attempt the trail in the high season and all the huts were full. But we did not give up. After some detailed research we discovered that there were enough hotels scattered along the route for us to realise our plans. 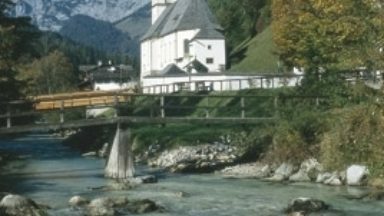 Sometimes this meant we had to take a gondola lift down into the valley or even, on a couple of occasions, a taxi. Although this might seem a disadvantage, it turned out not to be. During our time on the E5 we met quite a few other walkers who were staying in the alpine huts. More than a few of them complained about them being overfilled, or lack of sleep due to snoring 'concerts' in cramped dormitories. Our experience was quite different. For us there was no queuing for showers, or sleepless nights in loud bunkrooms. In the mornings, an often-sumptuous breakfast buffet awaited us. In the evenings, after a refreshing shower in our room, we were able to enjoy a candle-lit dinner at a table set for two. What a luxurious way to begin or end a day's walking! However, the above should not be seen as a plea for hotels instead of alpine huts. 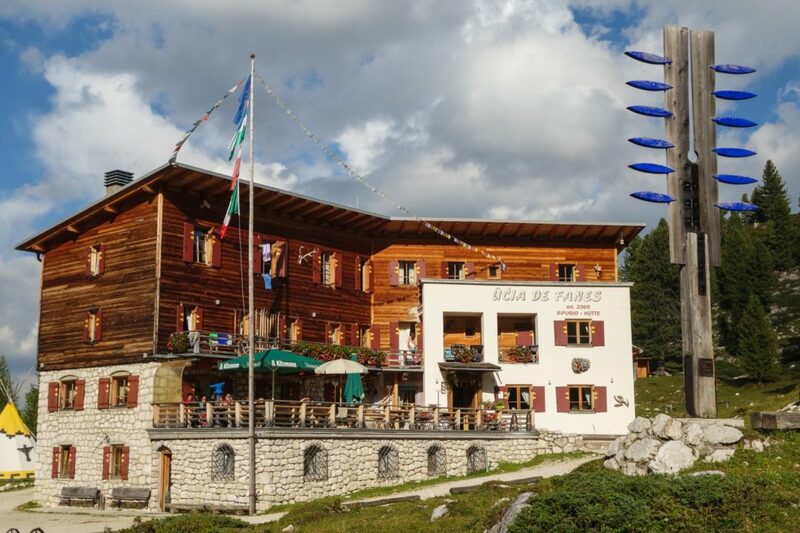 The experience of staying at a mountain hut is quite unique and something we have enjoyed many times in the past. I have simply tried to illustrate that having to adapt your plans around a dog, as inconvenient as it may be sometimes, can have pleasant results. 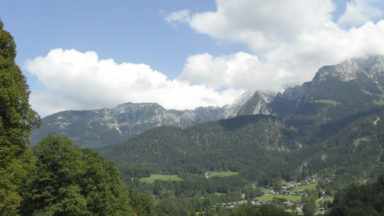 When doing research for our book on the Bavarian Alps we usually stay in a holiday flat rather than a hotel. Apart from being cheaper for a week-long stay, they also offer a lot more room. And we need that room with our dog. On arriving we have a car to unload that is not only packed full with our walking equipment, it is also contains all Khampa's stuff; his favourite dog food, a dog mattress, old blankets in case he does try to sneak onto the sofa, old towels to dry him if necessary, dog combs, a spare leash in case I lose one on the trail again, and the list goes on. Another great thing about holiday flats is that they have kitchens. Of course, this makes us independent of restaurants, but the biggest advantage is that we can cook for the dog. Khampa refuses to eat his dry dog food unless we enrich it with some choice pieces of meat. One of our first chores on arriving in town is to go to the supermarket in search of chicken fillets or minced meat; his favourites. Then, that evening, we cook it all so that it is ready to be served in his dog bowl the next morning. Not that we do not go to restaurants. After a long hot day on the trail one of the nicest things for us all to do is to sit down in a local beer garden. For the dog they are wonderful places. Dirndl-clad waitresses are continually rushing by, carrying trays laden with all sorts of delicious smelling meat dishes. Khampa always sniffs enthusiastically as they pass, probably in the vague hope that something may fall down. 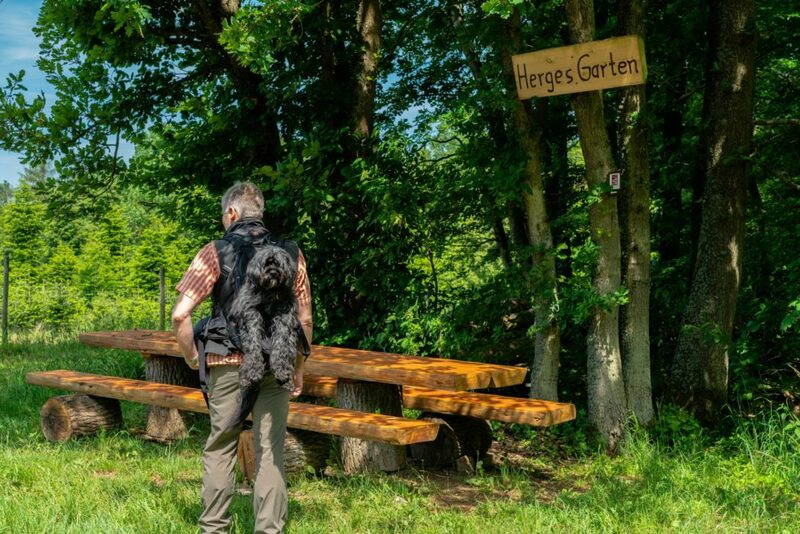 With plenty of space for a dog to stretch out, and often shaded by large leafy trees, these beer gardens are about as close to dog heaven as it gets. 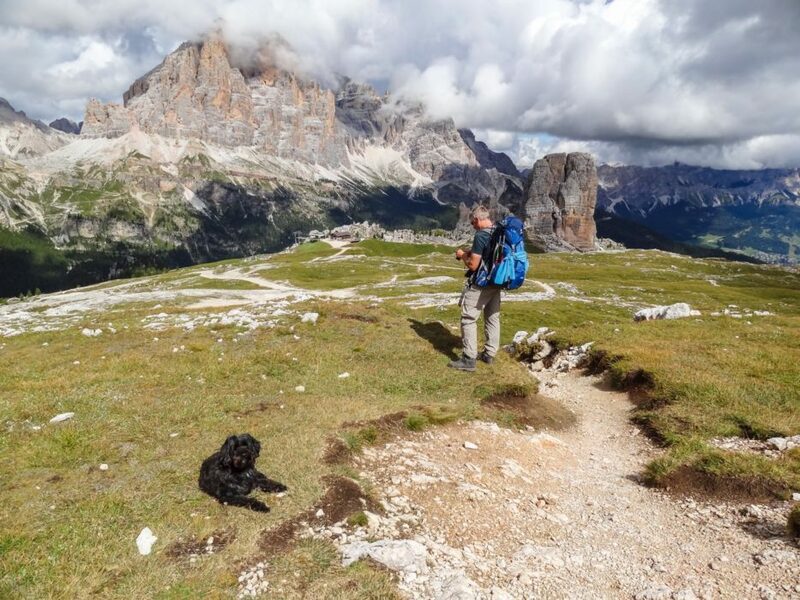 When we are walking an alpine trail, we try to bring with us anything the dog might need. 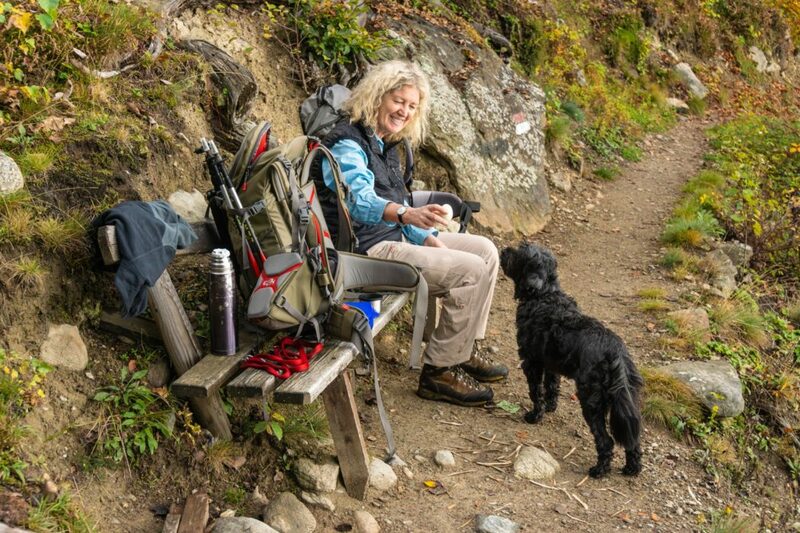 There is always an extra water flask, and some treats for him to nibble, stowed away in our backpacks. But now and again something unexpected happens. Once, when I was alone with the dog, we were nearing the end of the trail when suddenly Khampa ran a short distance away from the track. He sniffed the ground and then proceeded to roll around vigorously in a patch of grass. Guessing the worst, I ran over to him and sure enough his coat was smeared with some kind of excrement. He stank terribly. I did my best to wash it off but to no avail. There was no way I could take the bus back to town as I had planned. Instead, I was forced to walk the 10km or so with an irritatingly happy looking animal. After that dog shampoo was added to the vital accessories in my backpack. Now that Khampa is quite old I have been forced to get a new piece of equipment for him. As he can no longer climb steep slopes under his own steam, I purchased a special backpack; it has a hole for his tail and openings for his legs. The sight of me striding up a mountain slope with a smug looking dog on my back produces much amusement among other walkers. It is a bit like it was all those years ago, when he was a puppy and reluctant to walk. 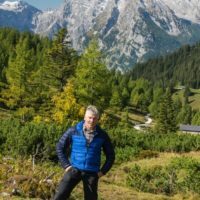 In the more than 15 years that he has been with us, Khampa has walked every trail described in our guide to the Bavarian Alps. Despite the limitations of age, he still loves being in the mountains. 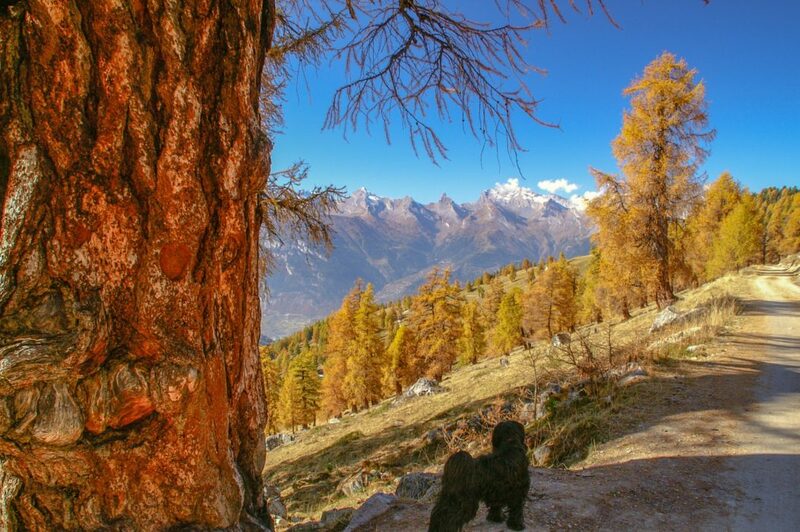 We hope that our little dog from Tibet is able to be with us awhile longer, to enjoy a few more times the smell of mountain meadows and the solitude of a high alpine trail.